If you were stranded on a deserted island with no exercise equipment, you could still develop your upper body by doing push-ups and pull-ups (if you can find a convenient branch). Between those two exercises, you can work most major muscles in the upper body and maintain or even increase your strength and muscle mass. For the sake of working out, the body can be divided into three parts: the upper body, the core and the lower body. The upper body muscles make your arms move, the core muscles make your torso move and the lower body muscles make your legs move. Read More: Why Are Pull-Ups Hard to Do? The actions of the upper body muscles can be divided into two categories: pushing and pulling, or reaching and pulling. One set of muscles makes your arms go away from you, and one set brings them towards you. You can push or pull something in front of you, above you and out to the sides. The biggest pushing muscles are the deltoids, or shoulder muscles, and pectoralis major, the main chest muscle. The pec major runs from the front of your shoulder to your sternum and is the largest pushing muscle. The deltoids cover your shoulder and are very versatile. The front deltoid reaches the arm forwards and the middle deltoid reaches your arm straight up or overhead. The triceps are another pushing muscle located on the back of your arm. They aren't as big or powerful as the chest or shoulder muscles, but they play a critical role in straightening out your elbow as you push something away. The biggest pulling muscles are the latissimus dorsi, or lats for short. The lats are actually the biggest muscles in your upper body, and span from the entire lower half of your spine to the back of your shoulder. These muscles lie on the sides of your back and, if they are developed, look like little wings. The lats get a lot of help from smaller muscles in the back. The rhomboids, teres major, rear deltoids and middle and lower trapezius muscles are all back muscles that help you pull. Your biceps, the muscle on top of your arm, also help you pull by bringing your hand closer to your shoulder. They counter what the triceps do. Each of these muscles contribute a different amount to the push-up and pull-up. The push-up is a horizontal pushing exercise because your arms are pushing straight out as opposed to straight up. 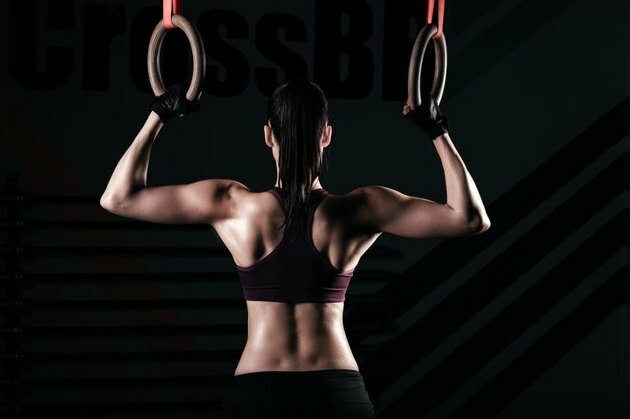 The pull-up is a vertical pulling exercise because you are pulling almost straight down, as opposed to a horizontal pulling exercise which would be pulling something towards you. For the pushing muscles, the more horizontal the movement the more the pectoralis major is involved. The more vertical the movement goes the more the front and middle deltoid are involved. The push-up is almost completely horizontal, so the chest muscles get a lot of work. The shoulders also work very hard, but not as much as they would in a vertical pushing exercise. The triceps works harder in a horizontal push then a vertical press. Another major difference comes in hand position. The closer your hands are to each other, the more you use your triceps, demonstrated a 2010 study in the Journal of Strength and Conditioning Research which compared the different muscle activation in six push-up variations. You alter the muscles used during a pull-up when you change hand positions. If you grip the bar with a shoulder-distance grip, your palms facing towards you, it's technically called a "chin-up." Your elbows will stay in front of you while you pull up. This variation involves the biceps and chest muscles more than the regular pull-up. The lower trapezius is much more active in the pull-up, according to a 2010 study published in the Journal of Strength and Conditioning Research comparing muscle activation in the pull-up and chin-up. 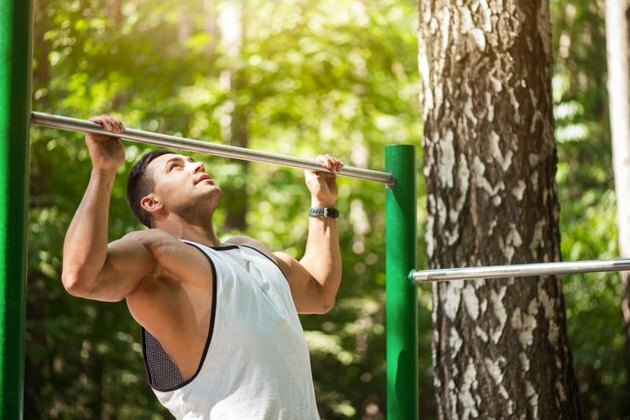 Read More: Are Pull-Ups Harder Than Chin-Ups? When your palms face away from you in a pull-up your elbows turn more to the side. This forces you to use more of the smaller back muscles like the rhomboids, teres major and trapezius. In order to get to the top of a pull-up, you need to pinch your shoulder blades down and back, effectively sticking your chest out. These smaller back muscles do just that. Between push-ups and pull-ups you will work all of the major upper body muscles. There are some muscles, like the pectoralis minor and some of your neck muscles, that get left out. However, these muscles don't contribute to your overall upper body strength, which has more to do with moving your arms. Comparison of muscle-activation patterns during the conventional push-up and perfect· pushup™ exercises.